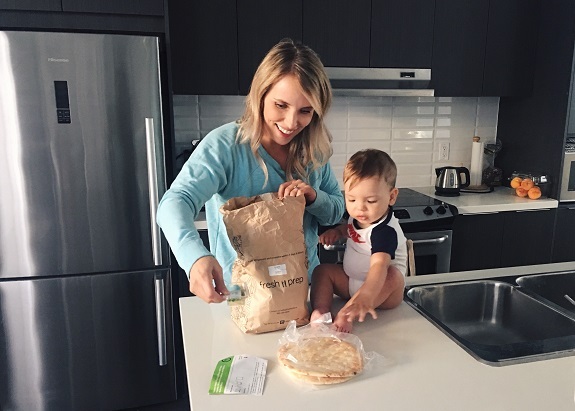 Melissa Cartier: Fresh Prep Now Delivers To LANGLEY! Fresh Prep Now Delivers To LANGLEY! I have been really uninspired when it comes to dinner ideas over the last month or so. I had finally figured out a process that works for me with planning meals but suddenly I couldn't decide on any meal ideas! Pinterest is bottomless inspiration and I have cook books galore but nothing. I think was a combination of the hot weather (which has finally ended... bring on the oven! ), the transition back to work and possibly my grocery budget. Trying new recipe ideas always ends up with my grocery list doubling which gets expensive. I have to buy four new spices to try this recipe? Seriously? Maybe I'm just doing the whole grocery thing wrong. Fresh Prep contacted me to let me know they were now delivering to Langley and seriously, this couldn't have come at a better time. I can't tell you how much pizza we've ordered these last few months out of laziness complete lack of motivation inspiration. This post isn't sponsored but Fresh Prep did generously send me two meals last week to introduce me to their service. I was immediately hooked and have already received this weeks delivery (which to clarify, I did pay for myself). Since each meal delivery includes pre-portioned out ingredients for each meal we have been able to try some new recipes without having extra ingredients leftover. Spices and sauces come in little containers so I'm not purchasing an entire bottle of something to try making a dressing I may or may not like. You can ask all of the unused bottles of sauces in my fridge how often I do that (insert eye roll emoji). You guys, I'm not here to do anything other than you tell you that Fresh Prep now delivers to Langley. If you're like me and looking for some variety and inspiration in your meal planning go check them out here! If you have any specific questions let me know and I'll do my best to answer them. We are only a couple weeks in but I'm a huge fan. Also, I just want to say to our pizza delivery guy... I think we should see other people. It's not you, it's me. You've been great. I just need to work on myself a little bit. You deserve someone better.